Luxury Florida home. Prestigious 5 bed, 4 bath holiday home with private secluded pool, situated in the exclusive resort of Indian Creek which is just 3 miles from Disney. In close proximity to highway 192 it is close to all the other major attractions, shops & restaurants. 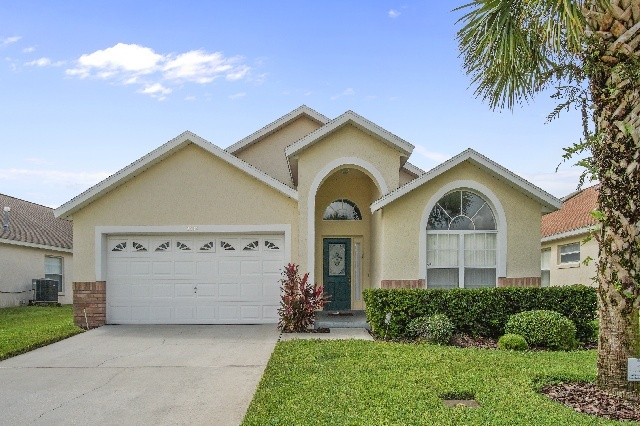 ICR5401 is a 5 bedroom, 4 bathroom villa, 5 min to Disney and golf courses - Large South West facing pool (giving sun all day), large pool deck with luxury furniture, huge 6 person spa - pool area not overlooked. Our villa has been equipped with the holidaymaker in mind; there is everything you need to make your holiday truly memorable for all members of the family from 8 days to 80 years! Games room, including full size pool table and TV/DVD. Cable TVs in all bedrooms, PS2, Digital TV in the Great Room (100+ channels) CD and DVD player. 2 en-suite master bedrooms with King beds, 1 Queen room with adjoining bathroom, 2 Disney themed twin rooms with shared bathroom. Free baby equipment (stroller, highchair and cot). DVDs, toys, console games and much more available at no extra cost. Superb 5 star accommodation close to shopping, restaurants and entertainment. There are 2 en-suite master bedrooms, both leading to the pool area. This makes the accommodation ideal for 2 families. The main master has a kingsize bed, double walk-in shower, twin sinks, large bathtub and walk-in closet. The second master also has a kingsize bed, built-in wardrobes and en-suite bathroom. Both bedrooms have cable television, clock radio, telephone and hairdryer. There is a further third double room with queen sized bed, built-in wardrobes, cable TV and an adjoining bathroom. The two twin bedrooms both have Disney themes; one is dedicated to the Lion King and the other to Winnie-the-Pooh and share a "Winnie-the-Pooh" bathroom. These bedrooms have been created with our younger guests in mind; each has cable TV with DVD player and the Lion King room has a Playstation 2. The Great room truly is great at 23 feet long by 16 feet wide, fully tiled, with high vaulted ceilings complete with skylights and ceiling fans. It has double French doors that lead out onto the pool area. There is ample furniture for relaxing in after a hectic day at the parks. It has digital television, CD & DVD player plus a selection of films and books. There is a fully equipped kitchen, including cooker, microwave, fridge/freezer with ice maker, dishwasher, double sinks with waste disposal, coffee maker, kettle, blender and all crockery and utensils. There are two dining areas in the villa, one in the kitchen ideal for breakfasts and snacks. The other is a separate more formal area for those special meals. A separate laundry room includes full size washing machine, dryer, iron and ironing board. Last but not least, is the games room which has a full size pool table, air hockey table, foosball table, TV with DVD player and seating. 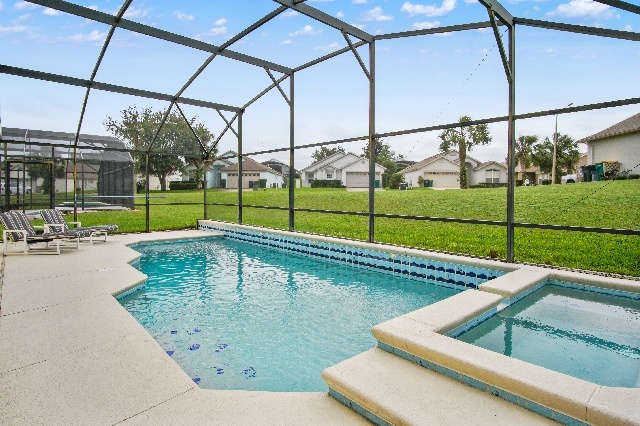 Pool and Spa Area: The pool area has everything you need to enjoy the Florida sunshine! It is South West facing and so enjoys the sun all day long. It is fully screened and not overlooked. There is a large lanai (covered porch) with ceiling fan that is perfect for al fresco dining or relaxing in the shade when you have had too much of the sun! The pool area is equipped with luxury cushioned furniture including chairs, reclining chairs, sun loungers and table. The large pool has been enhanced by the addition of a raised whirlpool spa, with more than enough room for six people. The pool itself has underwater lights and a waterfall from the spa, creating the sound of gently running water to help you unwind. For your peace of mind there is a safety fence to safeguard the little ones. Gas heating is available (extra cost) for the pool and spa if required. Me gusto mucho la casa todo muy limpio quedamos muy satisfechos gracias y volveremos l próximo año. LA VILLA ESTUVO PERFECTA PARA NOSOTROS, SUPER COMODA, ORGANIZADA, HERMOSA VILLA CON BUENA DISTANCIA A LOS PARQUES. LO QUE NO ME GUSTO: NO HABIAN SUFICIENTES TOALLAS DE BAñO PARA 11 PERSONAS Y HABIAN MUCHAS CUCARACHAS AL FRENTE DE LA CASA Y EN EL GAME ROOM. APARTE DE ESTO TODO MUY BIEN. MUCHAS GRACIAS MAYRA POR TU EXCELENTE SERVICIO. Reply from Mayra (FBV) Muchas gracias por los comentarios, informamos a la administración de y ellos están añadiendo toallas y asegurándose de que no haya más cucarachas en la casa mientras estoy escribiendo estas líneas. Estimados clientes, por favor háganos saber, si mientras estuvo en la casa si usted necesito alguna asistencia. La administración de está ahí para ayudar y así como nosotros. Mayra buen día la verdad quiero agradecerte por todo mi familia estuvo muy contenta en la casa, la verdad es lo que esperábamos, mis únicos comentarios serian "la ropa de cama" si es muy barata para mi gusto pero son cosas minimas. Te agradezco y ten por seguro que te recomendaré a los amigos! Very nice villa. A great way to experience Disney. Allows you to get away from the crowds for a little while and recharge in privacy. Proximity to the parks makes this ideal. roughly 10 minutes to the furthest park. Clean and modern. Will definitely use Florida Best Villas again. I would recommend a better pest control in the game room, we saw many roaches during our stay.